With the Second World War over, Kiwis stood with their more powerful allies in the occupation of Japan. But with Britain increasingly preoccupied with its home affairs and Europe, New Zealand began to set its own foreign policy agenda. In this episode of The Years Back presenter Bernard Kearns explains how New Zealand turned to its own backyard to create new export markets. That also meant military involvement in Korea and Malaya and a sometimes fumbling attempt at being a colonial power in the Pacific. 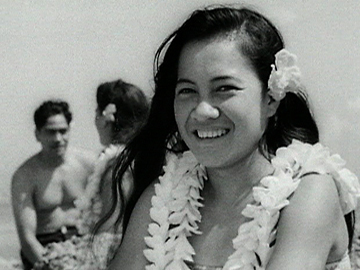 This 1951 National Film Unit production looks at the Cook Islands, and marks the 50th anniversary of the islands’ annexation in 1901. Unusually long (half an hour) for an NFU film, it shows history ("Vikings of the Pacific" through Captain Cook to New Zealand administration) and island life: spear-fishing, catamaran sailing, breadfruit gathering, weaving, dancing and singing. The islands are depicted as paradise guided by NZ paternalism, with the Islanders grateful recipients of modern communication, technology, health services, education, and... tinned meat. This 1961 edition of Pictorial Parade visits Western Samoa shortly before it gains independence from New Zealand. Locals are seen voting in the May referendum, where a huge majority voted to self-rule. Surgeon Ioane Okesene and his large family feature in this newsreel; daughter Karaponi is filmed marrying her Kiwi partner Bill McGrath in Apia. (Trivia fact: Rugby legend Michael Jones' mother, Maina Jones, is among the wedding guests.) Western Samoa's close ties to Aotearoa are highlighted, with stories of locals moving downunder to study, such as medical student Margaret Stehlin. This 1960 National Film Unit documentary visits the Cook Islands, a group of volcanic isles and coral atolls administered by New Zealand. Ron Bowie's film surveys the challenges of island life (sourcing fresh water, lack of timber for housing) as well as agriculture (coconuts), recreation and schooling. Though patronising — describing Rarotongan people as “the cheerful islander” — the narration confronts some impacts of modernity (eg the shift to European diet for dental health), and anticipates young people will be the islands' biggest export. 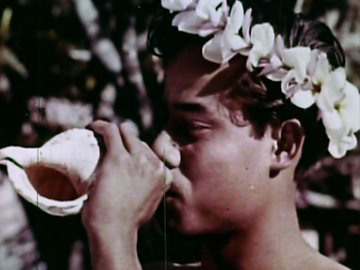 This 1949 NFU film visits Western Samoa. 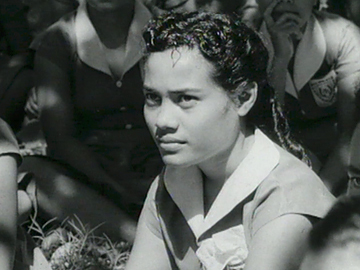 Director Stanhope Andrews surveys life in the “lotus land of the Pacific”, showing taro and coconut harvest, cooking in umu, and church and fale building, as “the flower-decked girls sing and dance beneath the palms”. The benefits of New Zealand’s then-administration are shown (eg. medical services, education) but the travelogue ignores earlier ignominious acts, such as the quarantine blunder that saw one in five Samoans fall to influenza. The Olemani Aufaipese (choir) provides the score. Samoa won independence in 1962.